What will our future be like? Well nobody can really answer that with any kind of certainty, but we can take a pretty educated guess. How will life on earth be in 10 years? How about 20, or 50, or 100? Will we go to school and prepare for a career, or still live in large families? Will we have more or fewer children? Will us humans still have jobs and a boss? Will we work for a large corporation or for ourselves? Will we own property; a home, a familiar place to reside; or will most of us travel around and stay wherever we find ourselves? How will we travel; will we still drive our cars, or will they drive us? Will we own the cars we travel in or not? Will robots replace human labor, and will people react positively or negatively to the loss of their jobs to humanoid machines? Will they announce their approval or their displeasure? What will our infrastructure be like; will we live in cities; inland or on the coast, or elsewhere? What will we do for recreation? Will we have more or less privacy than we do today? Will we still have money? How will we pay for things? Will we still have borders; a nation; a government; a president? Who will welcome the changing landscape of the future and who will oppose it? How big will the population of the US be, and what about the world? Will there be enough for everyone to eat? Will we have more wars or fewer? What level of cognition or awareness can an artificially intelligent computer, and therefore, a robot attain? Can we train a robot to think and solve problems? Can they morally interact with us, in our world? What level of human labor will they replace? How much like humans can machines become? Can they have emotions of love, or anger, or jealousy? Should a machine have rights? How will the advent of humanoid labor machines effect life on planet earth? What political and economic impact will be felt? These are some of the questions asked, and answered in a somewhat whimsical, fictional story set to take place starting in our immediate future, and spanning more than 150 years as told by first hand witnesses; some human, some not. Read what modern events and circumstances precipitate and drive the move toward automating our world. How an economic collapse of the US compels the nation down the path of a 'Marshall Plan' for automation, to rebuild the ailing US manufacturing economy, by moving the nation decidedly in the direction of building humanoid robots to replace human laborers. Learn the story of humanity from its earliest history to the present day and beyond. Follow the story and witness the advent of technology and the use of tools, which furthers the quality of life for humans. What forces drove early humans on a quest to invent the world in-which we live now, and what continues to drive us to seemingly invent a replacement for our own kind? Will we remain in control, or will computers and machines take-up the reigns of power and dominion of the earth, and will they pose a threat to our existence? The answers may surprise you. Everyone has heard that all jobs will eventually be replaced by robotic laborers, but how will that affect life on planet earth? The Autonomous Economy is a fictional, serious, and sometimes comical journey through generations, spanning about a century and a half, telling the story of how the world will be transformed by the advent of humanoid machines which render human labor obsolete. Its a journey of discovery, unfolding the little realized truth about what compels human behavior; why people work to survive; why they tolerate unfairness and inequity in political and economic terms; why they suffer abuse at the hands of more powerful people and groups; and what ultimate destiny lays ahead. 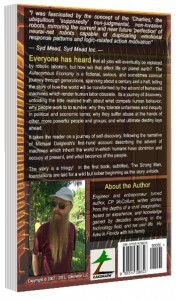 It takes the reader on a journey of self-discovery, following the narrative of Michael Dalgleish's first-hand account describing the advent of machines which inherit the world in-which humans have dominion and occupy at present, and what becomes of the people. The story is a trilogy! 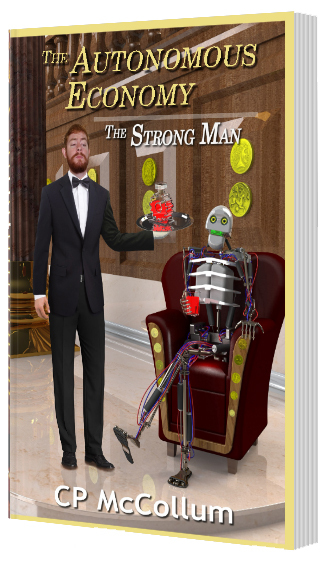 In the first book, subtitled, The Strong Man, foundations are laid for a wild but sober beginning as the story unfolds. Everyone has heard that all jobs will eventually be replaced by robotic laborers, but how will that affect life on planet earth? The Autonomous Economy is a fictional, serious, and sometimes comical journey through generations, spanning about a century and a half, telling the story of how the world will be transformed by the advent of humanoid machines which render human labor obsolete. Its a journey of discovery, unfolding the little realized truth about what compels human behavior; why people work to to survive; why they tolerate unfairness and inequity in political and economic terms; why they suffer abuse at the hands of more powerful people and groups; and what ultimate destiny lays ahead.